Mr. Salahuddin Abdul Subuhan, Cath Lab Technologist; Mr. Jubin Jose, Staff Nurse; Mr. Aiman Hamza Moosa, Cardiology Nursing Supervisor; Dr. Rajesh G. Nair, GP Cardiology; Dr. Anil Bansal Consultant Interventional Cardiologist; Ms. Ally Joy, Staff Nurse; and Mr. Basil Paul, Cath Lab Technician. 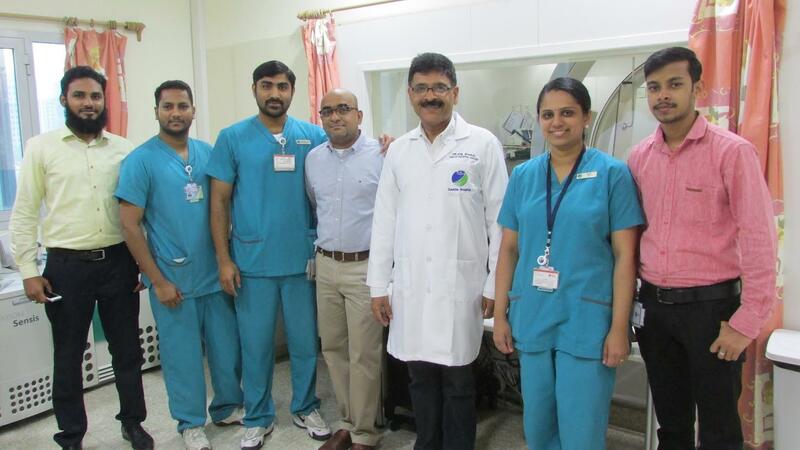 Dubai, UAE: A UAE resident has successfully undergone a rare vertebral and internal carotid artery stenting procedure at Zulekha Hospital in Dubai to enhance his quality of life. Fifty three year old Mr. Muhammed Najeeb complained of long-term dizziness and pain in his legs for a year caused by the abnormal narrowing of his dominant right vertebral artery at its origin, as well as in the left internal carotid artery. The debilitating condition meant that Mr. Najeeb was unable to walk a distance of over 100 metres and relied on his family for round-the-clock care.The risk factors that predominantly caused this were smoking, high cholesterol and diabetes as well as having a family history of the condition. Dr. Anil Bansal, Consultant Interventional Cardiologist at Zulekha Hospital in Dubai, part of Zulekha Healthcare Group which is the oldest and leading private healthcare providers in the UAE, met with Mr. Najeeb where he underwent an angiogram to identify the issue. On receiving the results, Dr. Bansal first administered a stent in the left common iliac artery which was a procedure lasting over an hour, which ensured immediate relief and respite from the pain Mr. Najeeb was experiencing. Another stent was then administered to the right vertebral artery. The following day, the doctor administered a stent into the left internal carotid artery. Prior to his life enhancing procedure, Mr. Najeeb had visited multiple doctors complaining of the condition and was treated with common stenting procedures. He had been living with the pain without medication for relief and resulted in a diminished quality of life. Dr. Bansal added: “Mr. Najeeb’s condition required him to undergo a rare stenting procedure which could not be treated by more common alternatives. We are delighted to have been able to drastically improve his quality of life through this unique treatment, and are encouraged by Mr. Najeeb’s decision to quit smoking that could prevent further complications and health implications. Carotid stenting may be beneficial in acute ischemic stroke treatment because deployment of a stent with or without angioplasty establishes immediate patency of the carotid lesion preventing vessel recoil and secures continuous catheter access to the intracranial vessels. It stabilises and protects the endothelium preventing iatrogenic (caused by medication) dissection of the vessel wall. Furthermore, acute stenting ensures ample blood flow to the intracranial vasculature, especially in case of contralateral carotid lesions or unfavourable anatomy of the circle of Willis (collection of arteries that supplies blood to the brain), and may assist intracranial recanalisation. As post-operative care, the patient will continue to take blood thinning medicines to avoid any pre-existing symptoms and prevent future strokes. The Zulekha Hospital brand is part of the Zulekha Healthcare Group, and is among the forerunners in UAE healthcare. Today the Zulekha Healthcare group includes two multidisciplinary hospitals in Dubai and Sharjah, as well as three UAE medical centres and three pharmacies providing specialised treatments in over 25 disciplines. The Group has also opened a multidisciplinary Hospital in India – Alexis. Zulekha Hospital has received extensive recognition for its commitment towards quality care and sustainable business practises, and recently received the prestigious Mohammed Bin Rashid Al Maktoum Business Excellence Award , underling a commitment to providing high quality healthcare to patients and society.